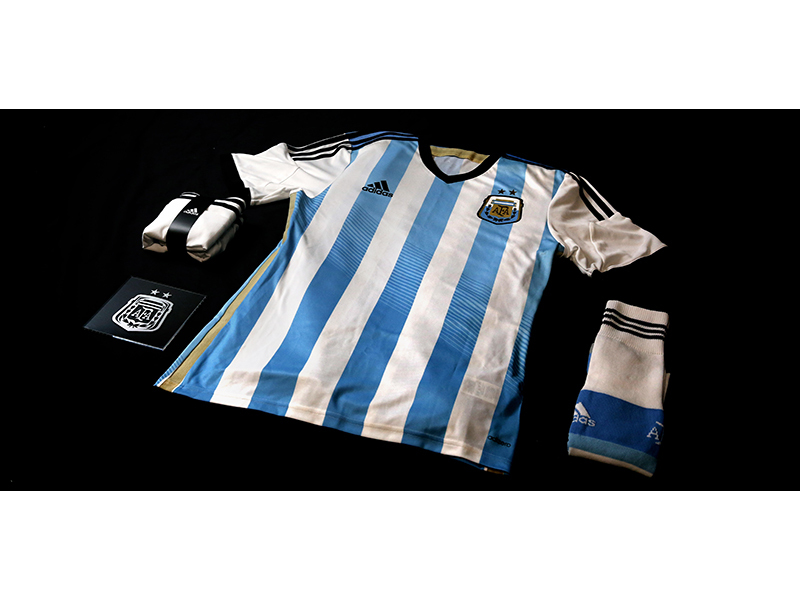 adidas is today proud to present the new official Argentinean Football Federation jersey to be worn by the team during the upcoming FIFA World Cup 2014 in Brazil. The jersey will be launched on-pitch tomorrow, November 15th during a friendly match against Ecuador in the state of New Jersey, USA. The most representative sign of the Argentinean passion, its national football team, and the most important and patriotic icon of the nation, the flag, come together in the design of this jersey. For the first time, through the sky-blue stripes of the shirt, there is a reflective visual effect simulating a Argentinean flag on top of a pole, waving in the wind. The crest also shows an evolution in this new design. Retaining its elegant essence, the golden AFA crest gains a more prominent presence contrasting with the white and the sky-blue colors of the shirt. It also contrasts with the golden lines on the sides and the upper side of the shirt. The official kit also includes white shorts and white socks with sky-blue stripes, complementing the flag-based inspiration and giving it a more modern look. The jersey weighs 100grams, making it the lightest shirt in the history of the Argentinean team. This is due to the incorporation of adidas' adizero technology, which provides added ventilation to the players, helping them stay dry during the 90 minutes of the match and truly acting like a second skin. The new Argentina kit will be available globally from November 14th in selected adidas retail outlets, associated stockists and via www.adidas.com/worldcup. Join the adidas football conversation at www.facebook.com/adidasfootball or on Twitter: @adidasfootball #allin or nothing.